IMG_1403, originally uploaded by Mic2006. 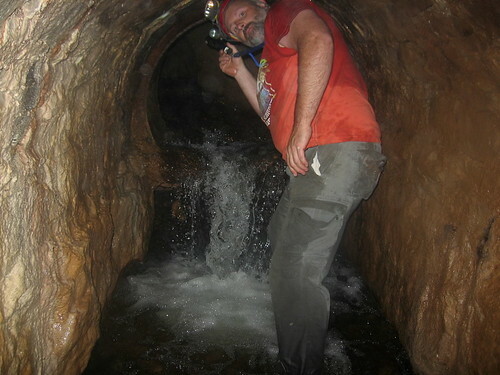 On the 5th of September I mentioned this old drainage tunnel that we found in the Belfountain area. Well there was one heck of a noise of falling water and in following it we reached an area where water was dropping down from a pipe that went straight up and water seemed to be spraying in through crevices in the wall. it turns out that this tunnel goes under a small but deep lake along the valley wall and so instead of being underground here, we are underwater. 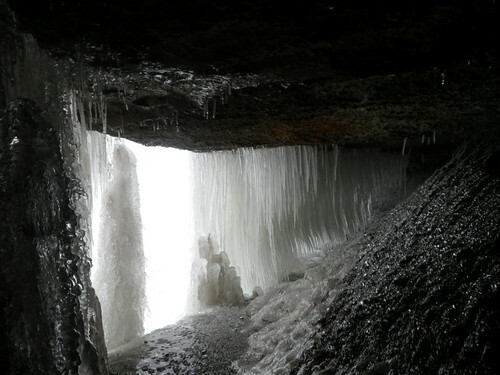 Just like in caves – falling water generates one heck of a breeze. I crawled up the pipe in front, but turned back at the base of the downfall because it was a little intimidating, very slick and you could hardly see for the wind and water in your eyes – besides, I could not see the point in emerging in the middle of a lake – short of swimming there would be no place to go. There is probably about 15 – 20 feet of water overhead. 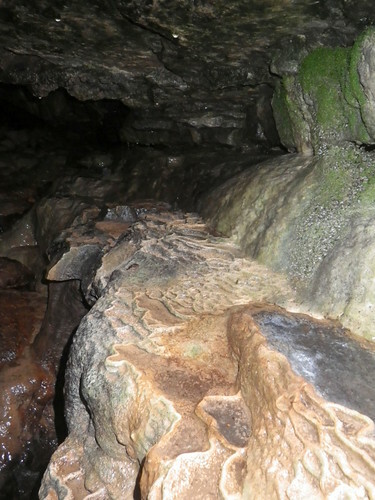 Over the past two years I have become increasingly aware of the presence of a karst area between Lake Erie and Hamilton. This area has been mentioned in a few past manuscripts -generally alluding to this possibility or that, or possibly a small cave or karst feature.The ‘North Erie Karst’ is marked by bare rock along the Lake Erie shoreline and gypsum conglomerate further toward Hamilton and Cambridge. 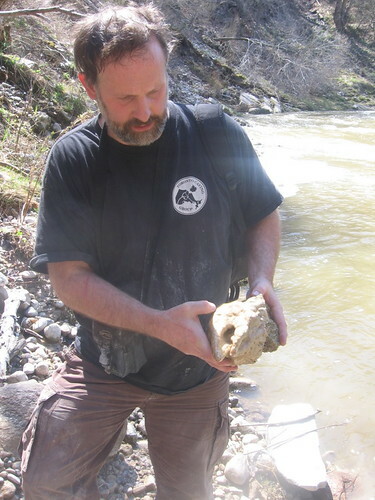 The most promising cave area in the North Erie Karst is on private property at the edge of which Jeff C. had an interview with the OPP as to why he was loitering there. The gypsum seems to stretch most obviously around Cayuga and Paris. Mines produced the substance from which casts were molded – “plaster of Paris” they called it. 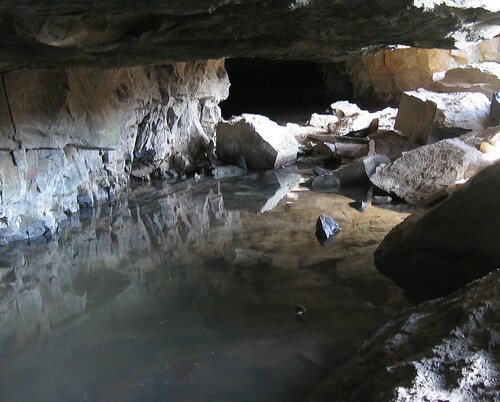 There are many abandoned mines – thus far by our observation they are small and mainly collapsed at the entrance. 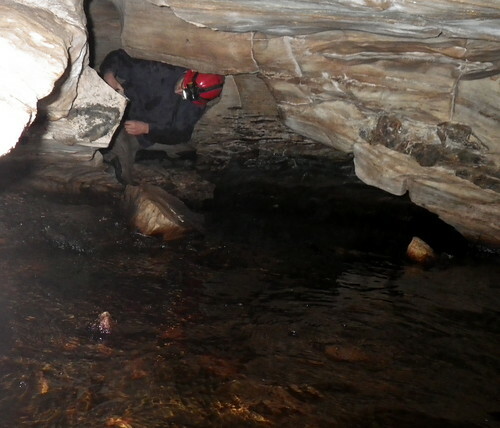 We would expect to find caves in rock which is so easily eroded. Thus far we have not been overly successful in either mine or cave location, but there have been a couple of diverse discoveries, most notably, Dead Mouse Cave, Bed of Glass Cave (both in limestone), a crevice cave at the edge of a waterfall in thinly bedded limestone above fractured shale, and a cave in conglomerate of which I’m sure there is more to see. I will explain this thus far unmentioned discovery in a post that I should get to some time in the next two weeks. Look for “Devil’s Cave”.